Across the world, people are becoming more environmentally conscious, from the clothes that they wear to the foods that they eat, and now that view of eco-friendly change has reached the realm of interior design and lifestyle choices. There is now a range of options available for people to experience cleaner living in their homes, from choosing more environmentally friendly sources of products to cutting down on energy usage and changing their daily living habits. 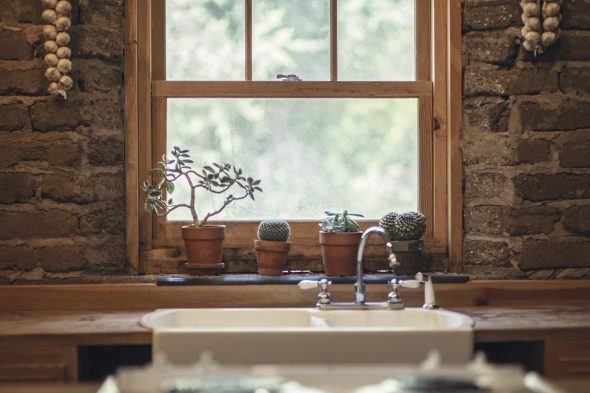 If you are interested in altering your home to become a more stainable and eco-friendly, here are a few factors for you to consider to get you started. Who says you can’t choose stylish furniture which is still environmentally friendly? You will find it is surprisingly easy to choose eco-friendly furniture once you know what you are looking for, and it doesn’t have to restrict your creative flare within your home. There is nothing wrong with buying wooden furniture: it creates a fresh, and natural atmosphere within the home, and has been used for centuries within craftsmanship. However, trees are important to our environment, as they provide oxygen, absorb carbon dioxide, and provide a habitat for wildlife, among other things. Therefore, if you want to help maintain natural woodlands, try to choose furniture which is made from certified sustainable wood, or which has been made using reclaimed wood. Some people find that too much-exposed wood within the home can become overbearing, but thankfully there is a range of other sustainable materials which are used to create furniture. Bamboo is another great, natural resource for furniture, and comes in slightly different sizes and shades, from light green to a darker brown color. As it is fast growing, once it is harvested for use, new crops can be planted immediately, meaning that the environment does not suffer greatly as a result of its usage. Bamboo is incredibly versatile and can be used for anything from flooring to furniture, and even window blinds. If you don’t want to restrict your material choices, even just choosing to buy local products will be more environmentally friendly, as the furniture will have a lower carbon footprint, compared to items which have been shipped across the world. If you buy handmade products from local craftsmen, you will be able to support your local economy, while choosing not to buy from large corporations which create a lot of waste material when forming their products. On top of that, with handmade furniture, you will also be able to get bespoke, unique designs which can’t be found anywhere else. There are lots of small changes you can make to your home to conserve your energy usage, which will not only help to save the environment but also your monthly expenditure. LEDs (light emitting diodes) are better for the environment than the usual incandescent bulbs, as they use up to 85% less energy, and will often last for more than 10 years. Many people are put off of LEDs as they usually produce a slightly cold, blue-hued light, which tends to create a less welcoming atmosphere within the home (though some people do prefer the cleaner look of this lighting style). However, if you want lighting which produces a warmer atmosphere, you can purchase yellow-based LED lights, which are much more similar to incandescent bulbs. Try to utilize natural light during the day, and simply switching off lights when you aren’t using them will also save you energy and money. If you really want to give your home an upgrade, then you might want to consider installing smart technology; which is something which more and more households are beginning to incorporate. Having a smart home means that you can control anything from your lights, heating, and even your blinds, from an app on a smart device, such as a mobile phone or tablet. This is not only an incredibly stylish and useful feature to have, but will also help you to reduce your energy usage. If you leave the house and forget to turn your lights off, or go on holiday and accidentally leave your air conditioning on, you can turn off your appliances with a simple click of button from miles away! This technology is simple, but incredibly effective. Heating water can be a particularly costly use of energy. However, there are companies available which can install sustainable water heaters in your home. For example, Green Planet Plumbing offers a range of solar-powered water heaters which will save you money in the long run, as they are powered by free energy. Solar panels can also be used to provide an energy source for your whole home, providing you with clean energy throughout. This will reduce your electricity costs substantially, and you can even sell some energy back to the grid if you wind up producing more than you can use. You can also reduce the amount of waste energy which your home emits by making sure that your house is properly insulated. Insulation is not just about keeping your home warm, but about protecting the energy within the home from being spilled into the outside atmosphere, and that includes maintaining cold, conditioned air from the warmth outside. The best ways to regulate your indoor temperatures is through double glazing, and proper wall insulation. There are also a few things you can do around the home which have less to do with your home design and revolve more around your way of life. A lot of the products you use within your home are often harmful to the environment, either due to the chemicals they produce or through their manufacturing process. For example, a lot of cleaning products produce harmful chemicals which are released into the atmosphere or are infused into the water supplies when you flush them down the drain. Therefore, consider buying products which are made naturally, such as lemon-based cleaners. You can also buy recycled products for around the home, such as kitchen roll. If you can include more locally sourced foods into your cooking, it will reduce your carbon footprint, as that way less energy is used in the transportation of the food. You could even grow your own fruits, vegetables, and spices in your backyard, or in planters in your home. Not only is this better for the environment, but you having plants indoors provides cleaner air, and you will know the organic origins of the foods that you grow. Growing foods is also a great way to use an underdeveloped garden space. These are just a few examples of things you can do in, and around, the home, to create an eco-friendlier environment for you and your family. Don’t feel like you have to go all out and change everything within your home all at once: even the smallest changes will make a difference.